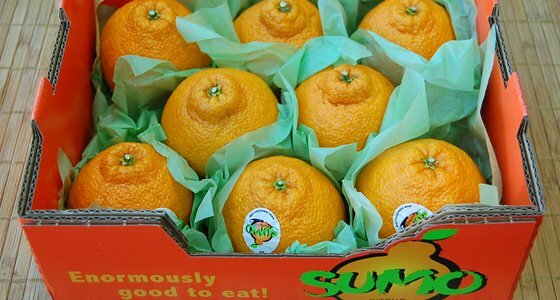 Have you ever tasted this sweetest orange born in Japan? You can try it at Nijiya stores, but we started shipping Sumo Gift to your friends or family in the USA! Of course, we can deliver this sweet orange to your home as well. We hope you enjoy our delivery service. The season for this item has passed. * “Ground Shipping” is only available in California. * Please select “Express” if you would like to send this item to other states. In the1970s a citrus grower in Japan set out to develop a fruit which would combine the best of the easy-to peel. Satsuma with big, juicy sweet oranges from California. This new fruit proved challenging to grow, but thankfully, grower persevered. It took over 30 years, but his hard work was rewarded. This new variety became the most prized citrus fruit in Japan and Korea. Now this legendary fruit, which is called Dekopon in Japan and Hallabong in Korea, is finally available for the enjoyment of consumers here in America. It’s grown on farms in California’s Central Valley to the same exacting standards of the original Kumamoto farmer. It is the biggest mandarin you’ve ever seen. It has a distinctive shape with a prominent “top-knot”. The peel is bright orange, bumpy and loose so it peels effortlessly. The delicate sections separate easily. It’s seedless, juicy without being messy, and it is quite probably the sweetest citrus you’ll ever eat.